← Get your FREE books! Is It Ever Right to Question God? I was in a conversation with some theologically astute friends and the concept of questioning God came up. On one side a friend said most assuredly that it was OK to question God and seek affirmation. On the other side another friend said it is never right to question God because of His holiness. With two opposing viewpoints, what are we to do? As the conversation was not heated and turned nonchalantly to other topics, the question lingered in my mind. How you answer this question has drastic implications on your spiritual life and understanding of reality. So what did I do? I did what what I teach. Before searching google, before consulting my favorite authors, before getting man’s opinion, I turned to God’s Word for guidance and asked God for wisdom. And I’m glad I did. The journey is just as important as the destination. As I surveyed the many texts that illustrate this question, I found some surprising insights. There are multiple cases in the Bible that explicitly say “Don’t test God” AND “Do test God”! What am I to do with that! I firmly believe in the unity of Scripture, so how do these narratives and principles work together? This was my task. Here is some of the data I sifted through. So what is with the Massah case? Here in Exodus 17 the Israelites were free from Egypt yet due to their thirst they were asking “Is the Lord among us or not?” They grumbled that Egypt would have been better than God’s plan. God commanded Moses to bring water from the rock for the people. This event was one of distrust and exemplified why that generation had to die off before proceeding into the Promised land. Ergo, testing/questioning God was very bad. Another instance of testing God that ended badly is in Acts 5:9. Annias and Saphira attempted to lie about their generosity. “Peter said to her, “How is it that you have agreed together to test the Spirit of the Lord?” We know how that ended for them. Both dead. They toyed with God, questioning whether he would really notice, He did. The Pharisees asked Jesus for a sign to know he was really the Messiah. He refused to allow himself and God to be questioned in this manner. In Matt 12:38 Jesus gives a major dis to the Pharisees and says “An evil and adulterous generation seeks for a sign, but no sign will be given to it except the sign of the prophet Jonah.” So, short of the resurrection, Jesus wasn’t giving any help to them. A heavy hitter, a righteous man, Job, questions all his troubles in life. When God responds to the “questioning” He never addresses the question, rather He sets Job in his place. He reminds Job of who he is addressing. Job’s response is classic as well as something that some people should imitate more often. In Job 40, Job realizes what he has done, and puts his hand over his mouth. I imagine a gasp emanates from Job as God speaks “out of the whirlwind”. Needless to say, Job stopped questioning. Isaiah 7:10-14 Evil King Ahaz did not want to test God even with a clear invitation to do so! Should we not question? Should we question? Ultimately, I believe this all boils down to a matter of the heart. God refuses to be mocked. He is holy and perfect in a way that demands our respect. He will not be questioned when it comes from a prideful, rebellious heart. Yet, God is a good Father. He knows what is in the heart of man and when we come with humility, admitting we don’t know all the answers, He welcomes us to find the answers in Him that we cannot find anywhere else. 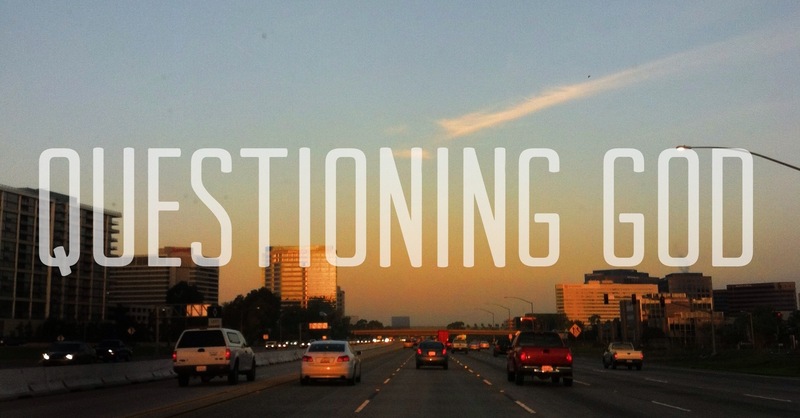 When it comes to questioning God, we must closely examine the condition of our heart. When I imagine the size of the universe, and I wonder what’s out past the edges. Then I discover inside me a space as big, and believe that I’m meant to be filled up with more than just questions. This entry was posted in Theology and tagged Chris Rice, doubt, questioning God, Questions, scripture. Bookmark the permalink. I really enjoyed this post Adam! I hope you’re doing well! hey brother! thank you very much. I am well and pray the same for you. Thanks for the insight Adam, it truly is a matter of the heart.